I have just trolled through this thread for the first time in months and I've go to say this is a truly epic build. Like Joel, I'm going through a car modelling fetish at the moment after many years on WW2 aircraft, but the techniques used apply across the spectrum and I'm certainly going to be stealing some of yours! As always you are very kind. Its good to be chatting with you of course. I think I might be in breach of site rules if you divert me onto the relative merits of our country's leaders, but there have been more glorious times in each country's history shall we say? Thanks very much. I reckon it's going to be an 18 month project by the time it is finished, maybe more. Steal away! Just about everything I'm doing here has been learnt from someone else or inspired by other guys, so I claim none of it as my own invention. You made me smile with your primer reference. It'll be aimed at the kit for sure... this time. Steve, like you, I'm just a big sponge. The proliferation of forums and YouTubers and Facebook pages around our hobby gives us an endless stream of ideas and techniques. The problem is I tend to spend more hours browsing than building. Yeah, I know the feeling. There's always something else to check out. I often have a build vlog or something playing away in the background while I build. Sometimes I miss the whole thing though, or get distracted and watch instead of building. Even so, today there is progress. 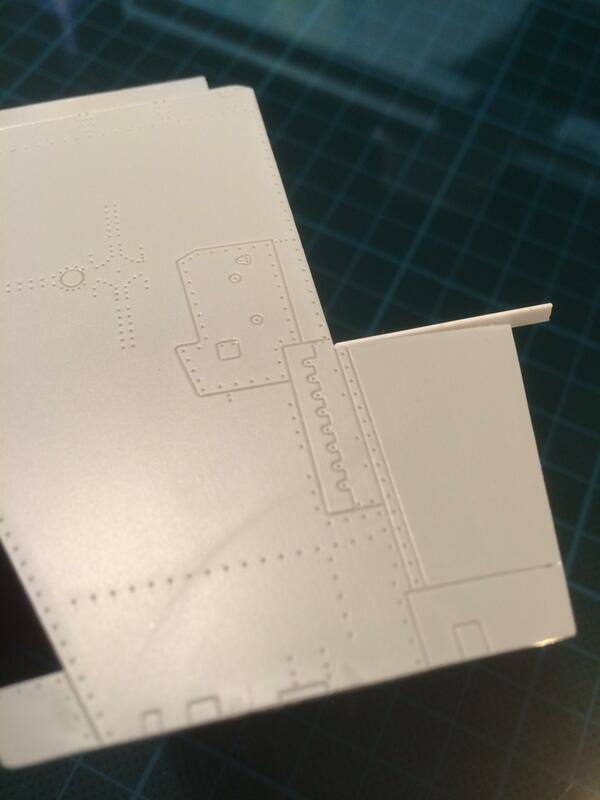 There’s a coat of black primer drying on the undercarriage, and Mr Surfacer drying in gaps in the drop tanks. While they cure I decided to turn my attention to the wings. These are nicely moulded, fit well and join neatly to the fuselage. Hold on. Has this turned into a dream about a Tamiya kit? It seems not, because there is one problem. The large inboard flaps are too short. They leave a gap between wing and flap. 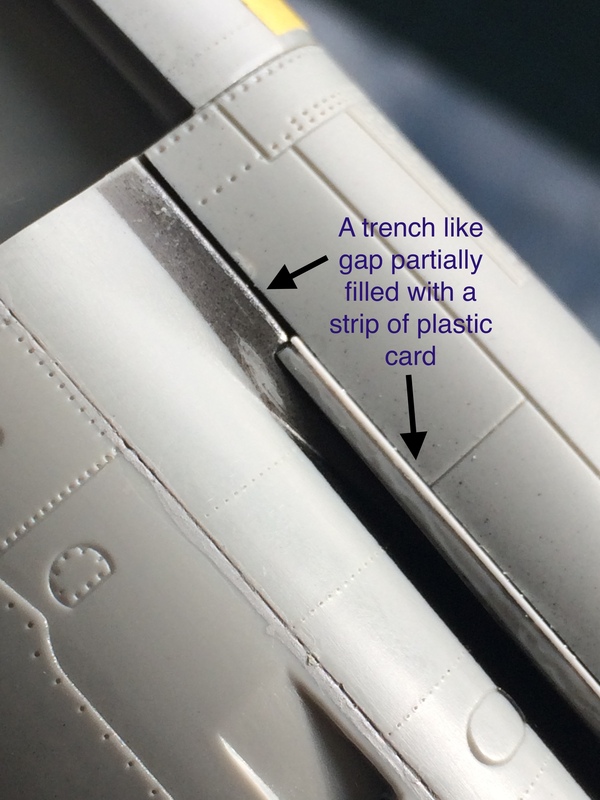 The simplest way to deal with this is to add a little material to the wing and push the flaps inwards. I just glued some plastic card in place, and tomorrow when the glue is dry I’ll carve and sand it to match the profile of the wing. There, back to reality. And here is the photo reconnaissance. Well, you almost got your wish. Yes nearly. It all seemed a bit too easy for a while, and I sort of liked it. I'm building something Tamiya-ish next for sure. Thanks very much. I'm pleased it helps. I'd love to see your work, especially how you tackle the panelling. Are you posting here? I’ve been checking references trying to figure out the colour of the front wheel well. It can look anything from a gloss mid-grey to polished aluminium. In the end I reached for AK Extreme Metal Dark Aluminium. I want a darker tone where the light don’t shine. 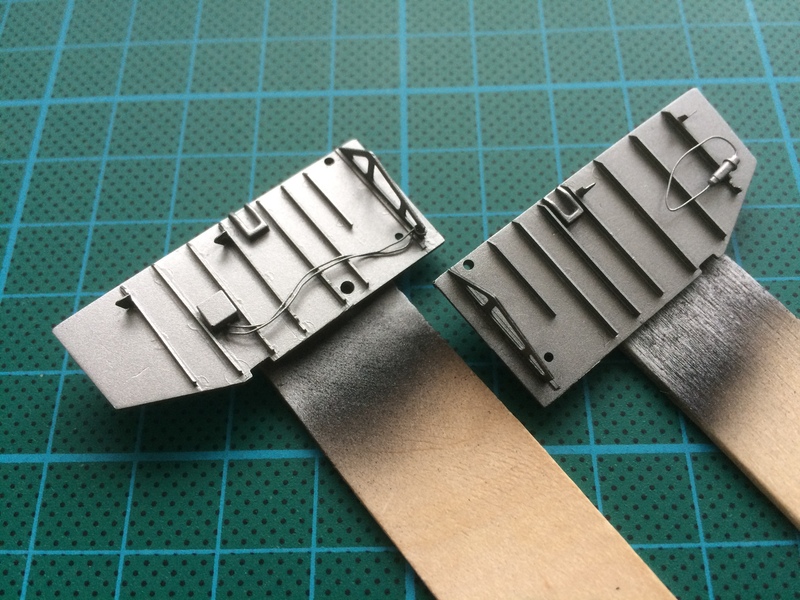 I’ll raise the value a bit at the edges with some simple colour modulation using a lighter aluminium. Before I painted the strut in the same colour I applied AK chrome to the piston. My plan was to make this part super shiny so it stands out. Actually when its surrounded by the other metallic paint on the strut its not noticeably different. I might need to think about that - maybe tone down the surrounding area with some weathering later. Here’s a couple of close up shots, and by the way, those glue marks and other little imperfections were totally invisible before I sprayed on metallics. Crikey, I’m going to have to take a lot of care with the fuselage. The 3 sections of the front wheel well looks great so far, as does the strut. Joel, thanks as always for the constant encouragement. Tim. that's a lovely clean build and super neat paint job on your Sea Furies. I like the in-flight look too. I've been toying with trying something in-flight for a long time. Maybe my next build (but here's a long list). If you feel like posting some shots on this thread, please feel free. Over the last decade or so there’s been an explosion in weathering products and techniques. At the same time we’ve seen new paints enter the market that make natural metal finish as, er…. metally as can be. Odd then that there’s so little written about weathering natural metal finish. Getting the shine is relatively easy these days, but weathering it is left to our imagination. That means we can play. Woo-hoo! I wanted a grubby, oily front wheel well without using harsh products that might lift the delicate NMF. In the end I hit on a technique that has served me well. If anything it’s over-weathered, but the recess is deep and shadowy so subtle would be the same as invisible. Take a look at the pics and see what you think. I haven’t made a video in ages so maybe my next one will explain how I did it. P.S. Sorry for one or two rather crappy photos. I couldn’t get the light right and even now the pics don’t really capture the look, but you get the idea. Hey Tim, that's great I'm looking forward to it. I really like the panel line technique you linked to but I've already added lots of rivet detail and I'm worried about sanding it away. I'll keep the idea in my head though for a future build - it gives lovely results. Thanks for sharing it. The front wheel well is done now. The shot below shows a section of brass rod I used to strengthen the attachment points. Without much more than delicate photo etch to give it strength, the front wheel attachment really needs beefing up . 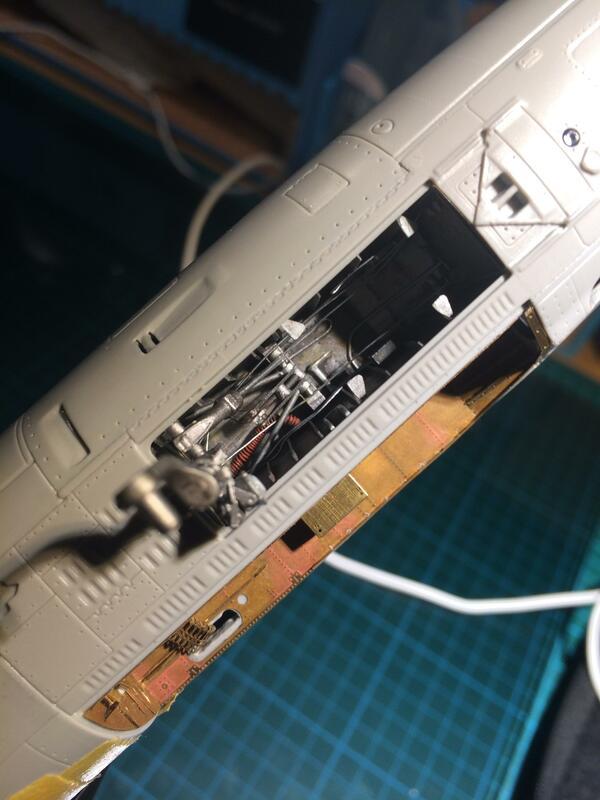 All that’s left to do now is some weathering to unify everything, adding a lens to the landing light, and of course adding the (resin replacement) wheel itself. Oh, there’s an actuator arm to go in too. I’ll insert the whole assembly into the fuselage later to avoid damaging the leg while I work on bigger fuselage parts, like the air intakes. Before attaching the inside parts of the air intakes I painted the area behind black. It’s going to be difficult to spray in there later. Harder to see are the thinned out leading edges. A test fit of the outer parts indicates there’s more filling and sanding in my future, especially where they meet the bulged fuselage. Not a good fit there. 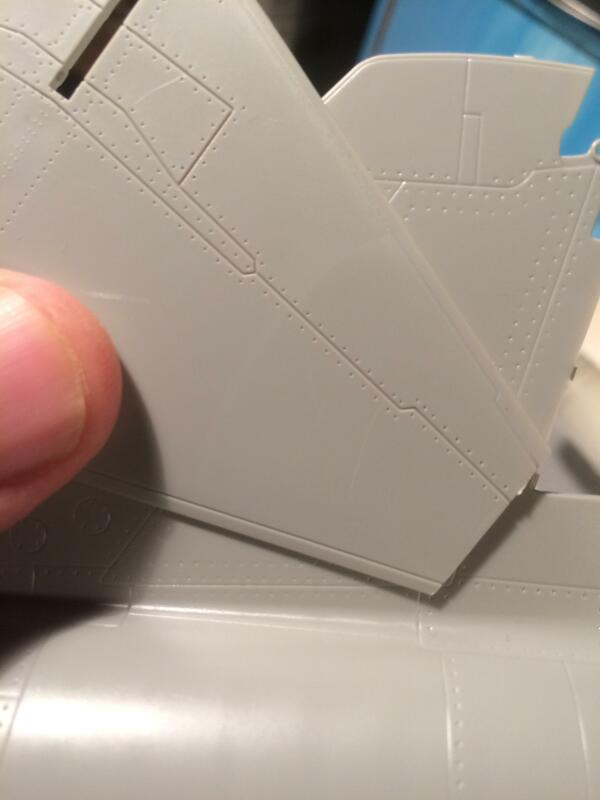 References also show panels in the crevice which aren’t reproduced, but would have been ideal for a PE part. So I looked and that nice Mr Eduard isn’t helping this time. Looks like Mr wine bottle foil might be needed instead. Thats’ all for now folks. I hope your plastic is cooperating. It’s been a while I know. 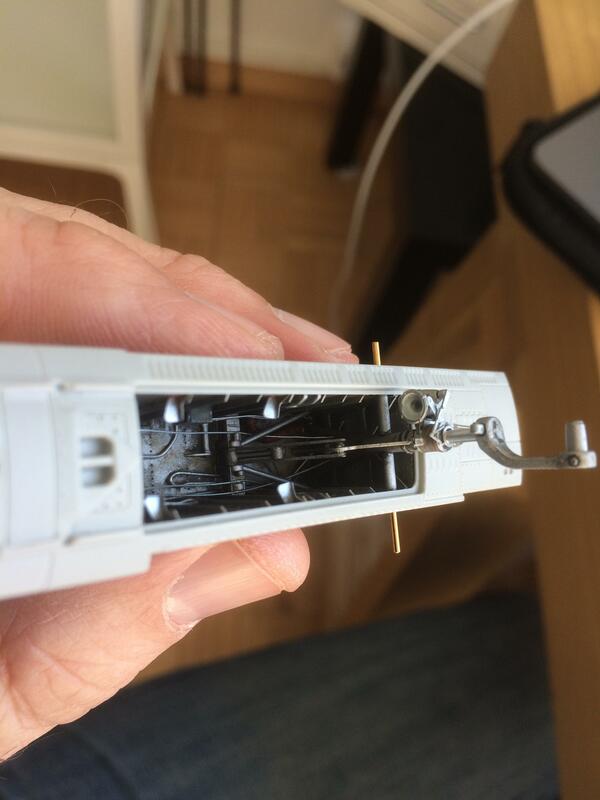 The modellers’ worst enemy - life - got in the way. Life it seems has a nasty habit of creeping up just when we least expect it, but as my dad often says; it’s better than the alternative. Back at the bench I’ve been procrastinating. 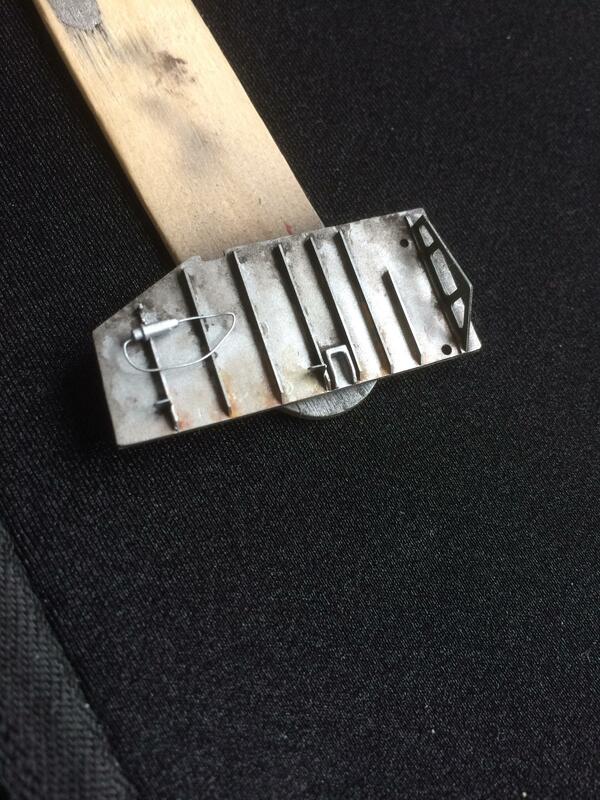 Should I stick with my original plan and go for a natural metal finish or opt for cammo? 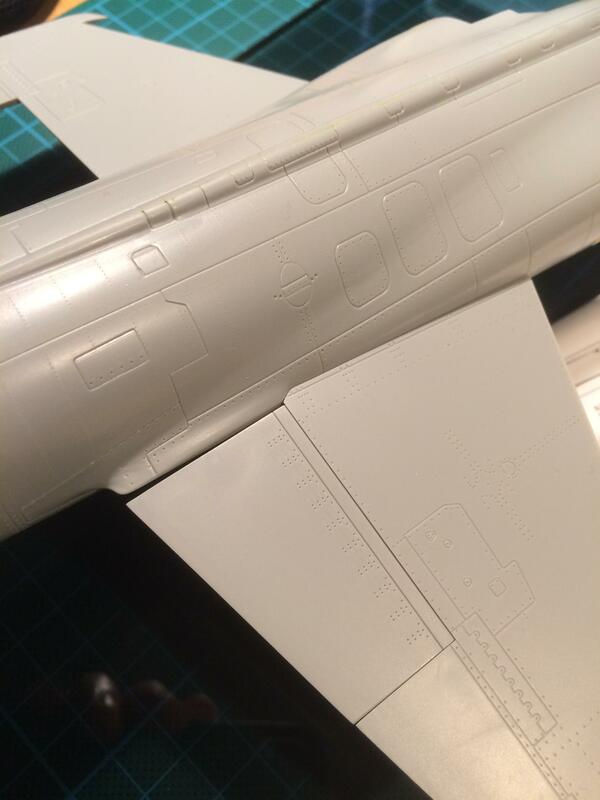 I’ve done so much work on the fuselage that I worry NMF will just exaggerate all the inevitable little imperfections. On the other hand the original aircraft isn’t perfect either. My references show scratches, dents, and overlapping panels. Maybe I just answered my own question? Maybe I really want to try some cammo airbrushing? Maybe I just need to decide? It’s a question now because I need to paint the inside of the air intakes and that means making a choice and sticking to it. Got any preferences? Meanwhile I have been getting areas ready for photo etch. 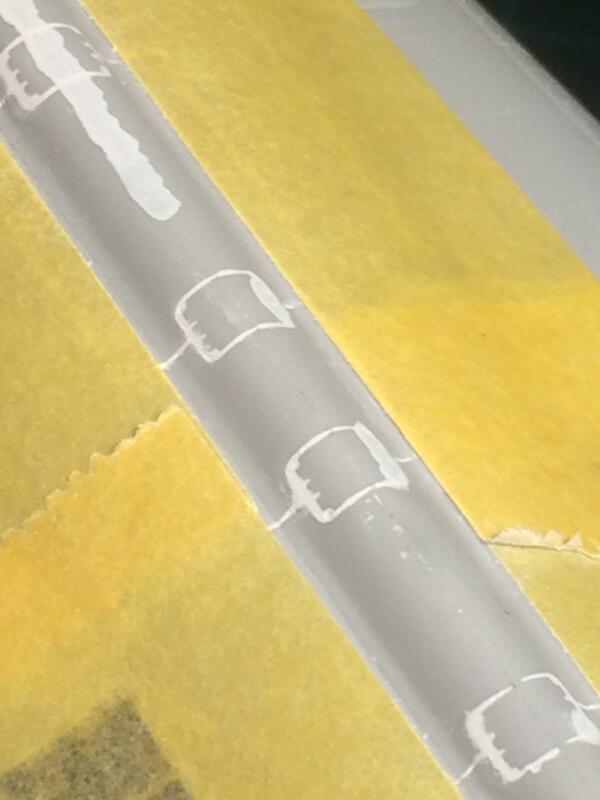 Eduard offers some nice replacements for the panels on the spine. 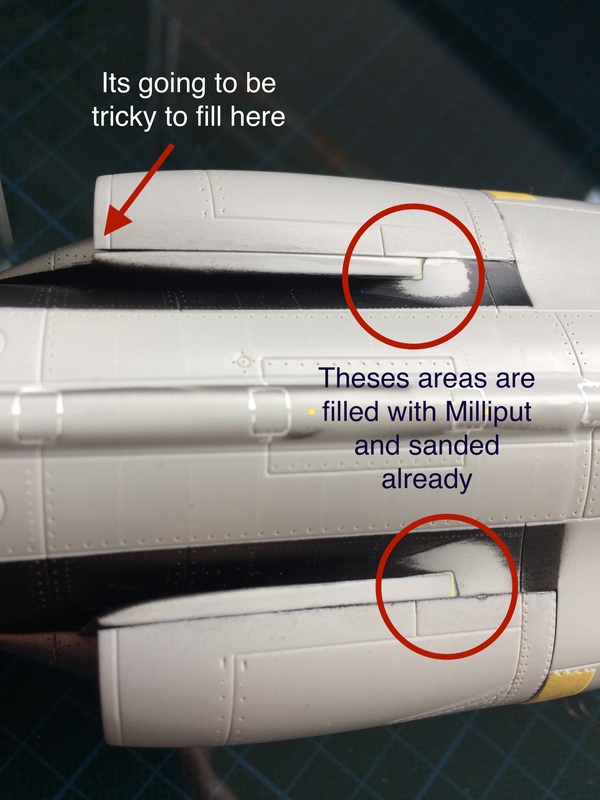 They are poorly moulded in the kit and flush with the fuselage when in reality they should be raised. More filling and sanding has prepared the area. Next I’ll give it a coat of primer, fix any remaining problems and glue on the panels. I’ve also been taking a look at some other fuselage parts and marvelling at how Italeri’s details are so insistent. Take a look at the shot below. I hope you can see how the piece on top has crisp moulding but the piece underneath is soft. They look like they are from different kits. In addition there’s a rough surface texture to some parts just as there was on the Mirage. That’ll need sanding down with the possibility of having to rescribe panel lines and rivets afterward, especially if I choose NMF. Hmmm decisions, decisions (again). It almost makes Brexit seem easy. Natural metal finish. I decided to stick to my guns. 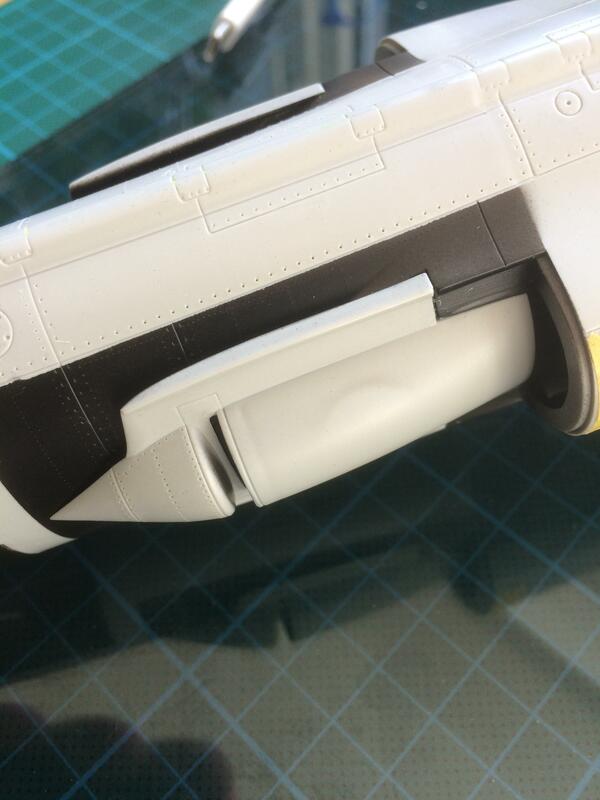 With the choice made, I airbrushed the fuselage-side air intakes gloss black in preparation. That felt good. Somehow just making a choice is rewarding. 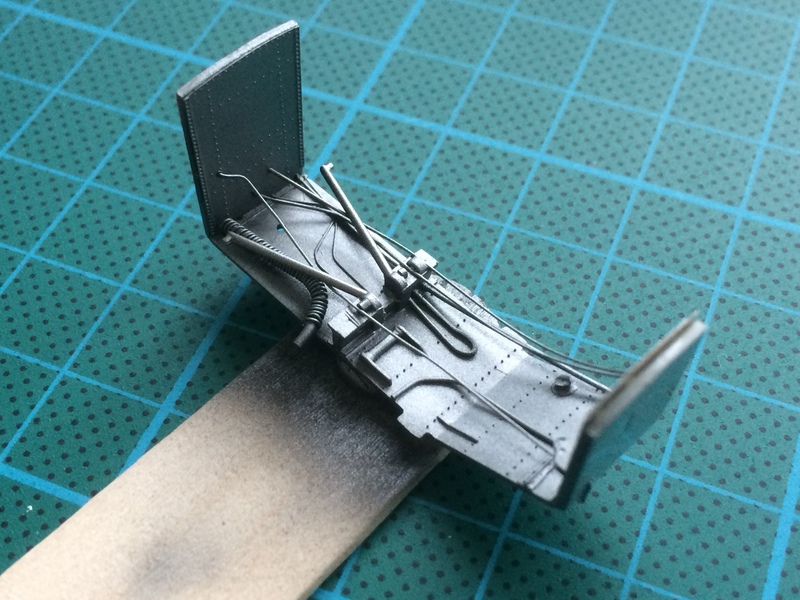 Turning to the rear fuselage I sanded out texture, reinforced panel lines and added extra rivet detail. The interior will hardly show once the exhaust is in place but I gave it a coat of gloss black just in case. 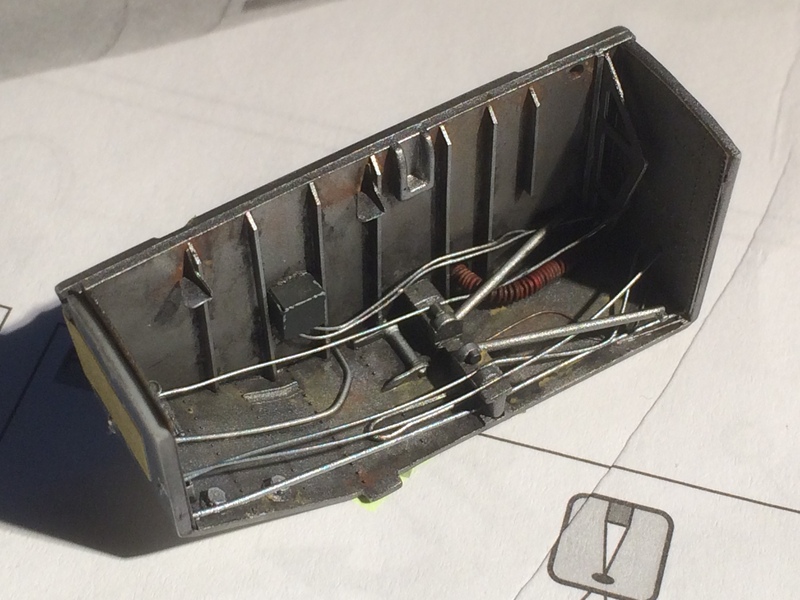 Oh, and the clear navigation lights were glued in place and painted on the inside - Tamiya clear red first then Valejo silver. 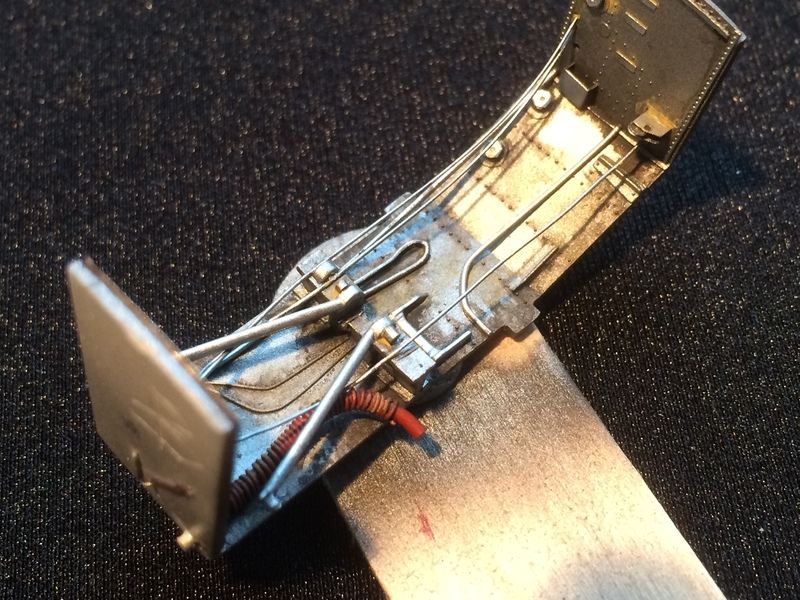 Finally I cemented front landing gear bay into the fuselage. 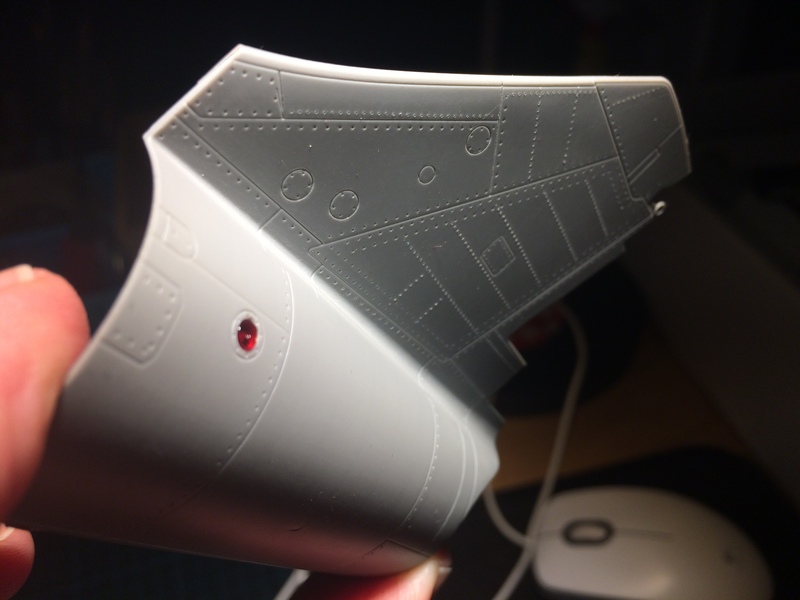 On reflection I decided not to fit the PE fuselage panels yet. 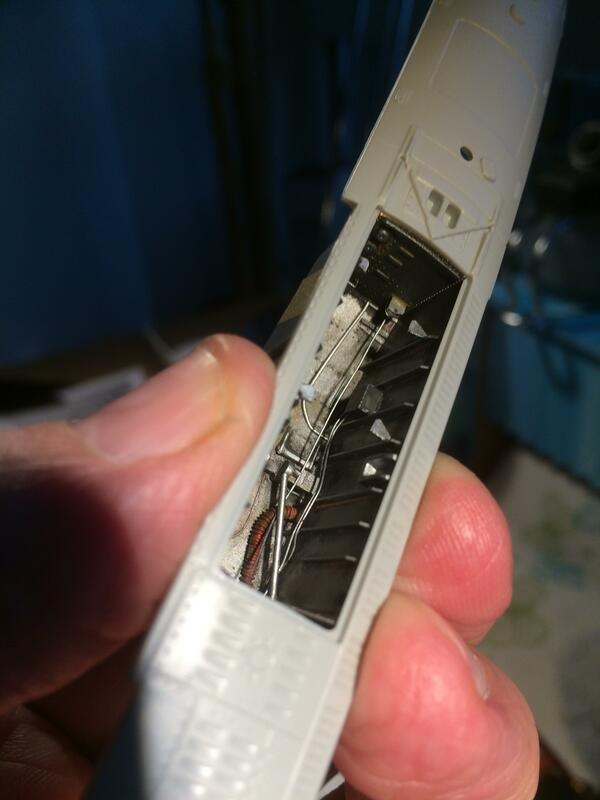 I’m handing the fuselage a lot and there will be filling and sanding when I glue the air intakes together. I don’t want to damage them. Photos you say? Oh yes, photos there are. Glad to see you came down on the side of NMF Steve. 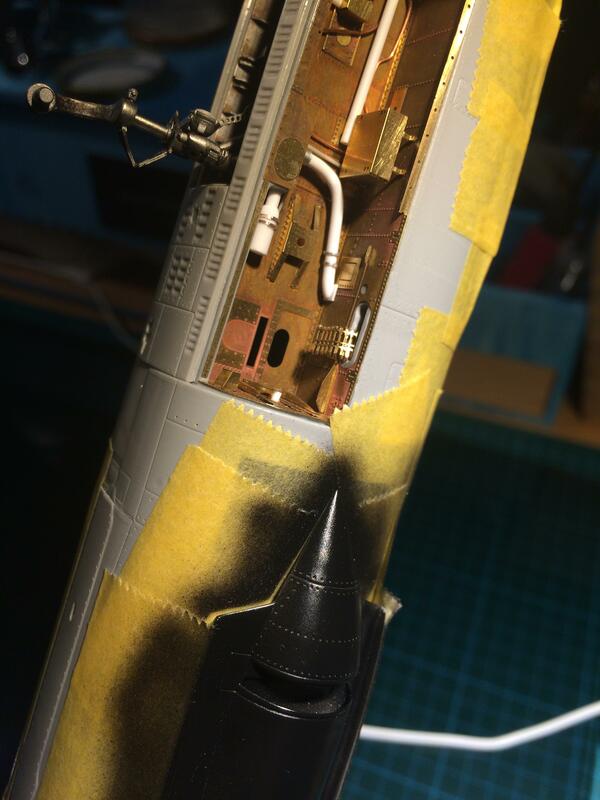 It should look great especially with your approach to weathering. Having caught up on three months of your posts the wheel well looks superb. The attention to detail has made a real difference. looking forward to see how you go with the intakes. The Zipper is a handful I can see from your build. Mine has been too slow, but my spray booth came in to install this weekend...not easy getting back in the saddle, but your thread helps!! Good to hear from you. Thanks very much for the feedback. This kit is definitely a journey. Yup, in the end I'm looking forward to putting down NMF. Tim good luck and get stuck in. I'm sure you won't regret it once you get underway. 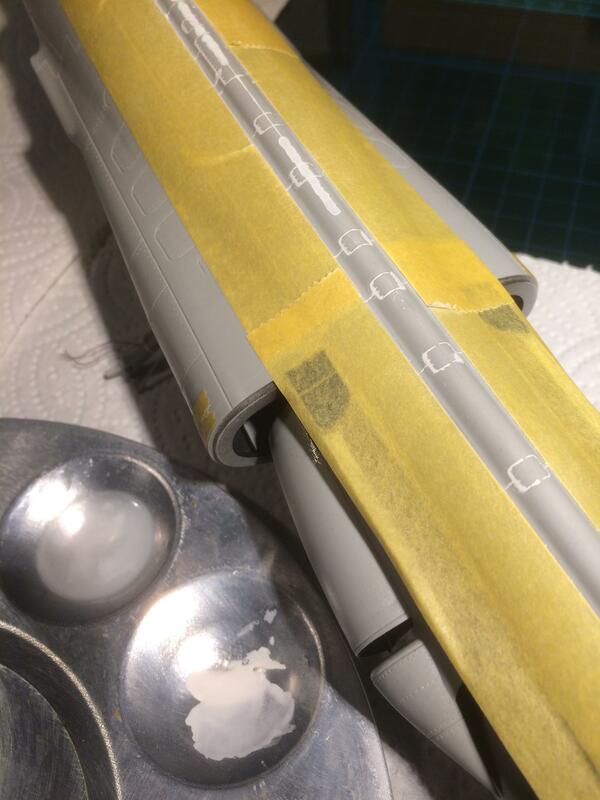 After painting the insides of the air intakes I glued them together. Well, to be more precise I glued the few places where they actually touch each other. I’m not sure if it was my sloppy construction or Italeri’s sloppy engineering but there are big gaps. I decided to experiment and try different filling techniques. 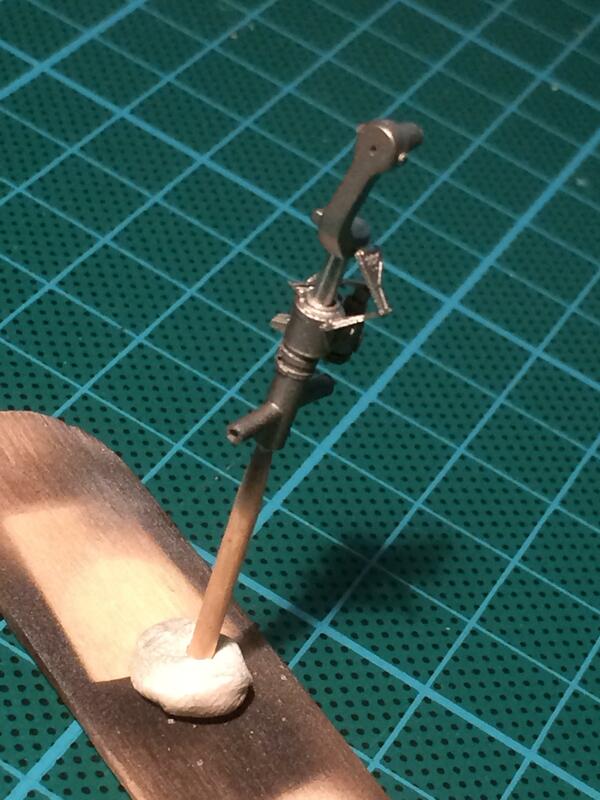 Best of these was using thin strips if plastic card or stretched sprue to bridge the gaps. 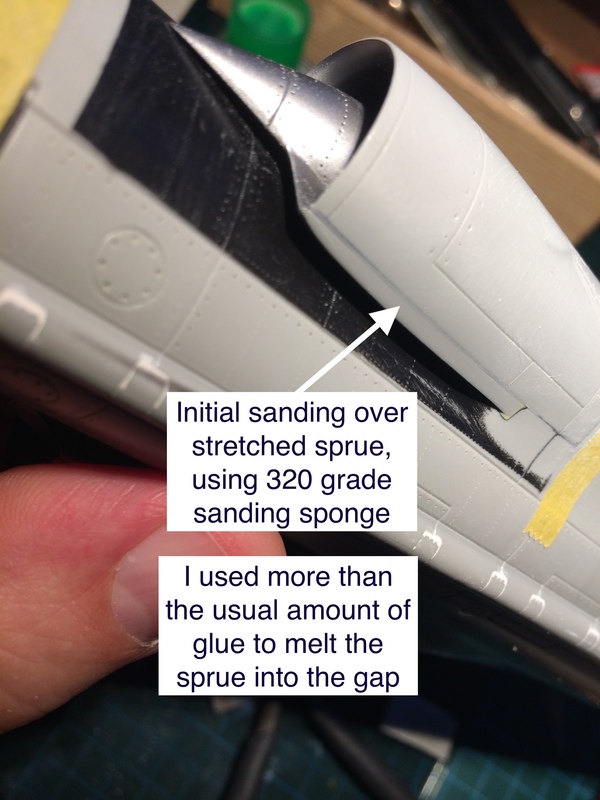 There’s less mess and a more precise application than using putty. 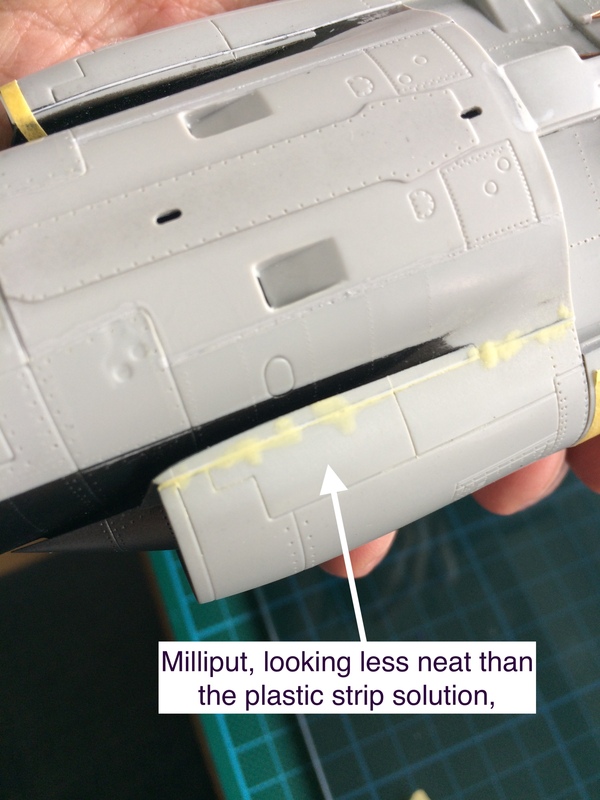 I tried Milliput in a couple or areas and it’ll work fine, but I like plastic on plastic better. Check out the photos and see what you think. Another catch-up stroll through this thread for me, it is coming along beautifully! Lots of challenges, but lots of great solutions as well. Have you mixed yourself up a bottle of "Sprue-Goo" yet? 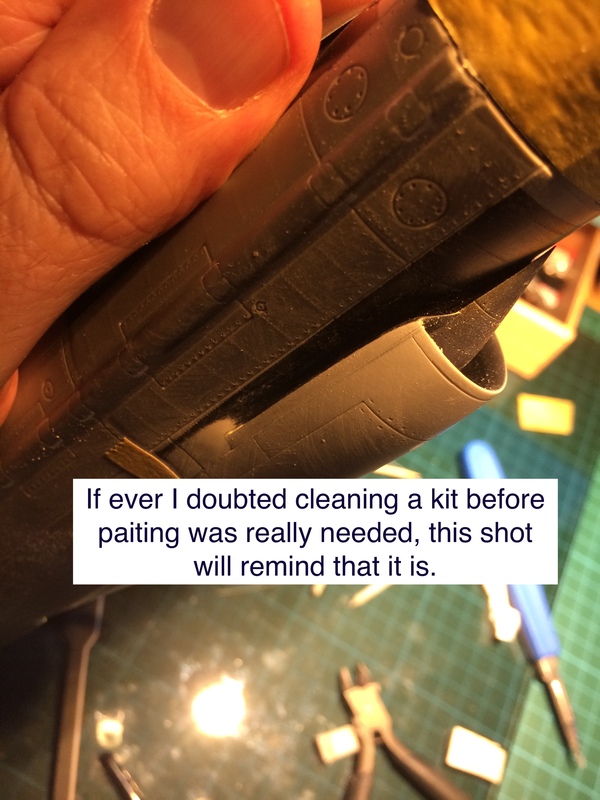 If not, it's a really valuable weapon in your arsenal for filling fine gaps and surface blemishes.